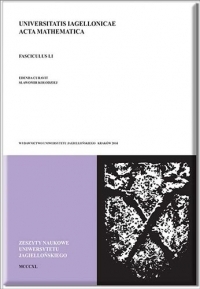 Universitatis Iagellonicae Acta Mathematica is a continuation of Zeszyty Naukowe Uniwersytetu Jagiellońskiego. Prace Matematyczne. Volume numbers are continued. Volume 24 is the first to appear under the new title. Universitatis Iagellonicae Acta Mathematica contains significant research articles in both pure and applied mathematics. Papers intended for publication must be well written and of interest to a substantial number of mathematicians.